Dental prosthesis technicians construct and repair full or partial dentures or dental appliances. Make, alter and repair appliances for patients with cleft palates, braces and plates for correcting irregular teeth and mouth guards. Create models of patient's mouth by pouring plaster into dental impression and allowing plaster to set. Melt metals or mix plaster, porcelain, or acrylic paste, and pour materials into moulds or over frameworks to form dental prostheses or apparatus. Remove excess metal or porcelain, and polish surfaces of prostheses or frameworks using polishing machines. Load newly constructed teeth into porcelain furnaces to bake porcelain onto metal framework. 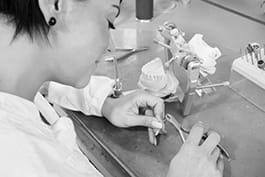 Evaluate functionality of tooth model by positioning the model on apparatus that mimics bite and patient's jaw movement. Polish and finish appliance prior to it being placed in patient's mouth. Consult the work process file(s).